THE new music wells 78-18 celebration of music will take place from October 12-18. Among the various world premiere performances will be a new work by this year’s composer-in-residence, Diana Burrell, whose new piece will be premiered by Wells Cathedral Choir on Thursday, October 18, at the 5.15pm service of Choral Evensong. She will be in conversation with fellow composer Michael Berkeley on Wednesday, October 17, in Quilter Hall (Wells Cathedral School), and will give a public composition masterclass in Cedars Hall on the afternoon of October 18. Admission to all these events is free. There will be five lunchtime concerts during the week, all at 1.05pm-1.50pm. Admission to all lunchtime performances is free, with retiring collections to support Wells Cathedral Music. • Friday, October 12: Oliver Chubb (trumpet), accompanied by David Bednall (organ). • Monday, October 15: Specialist pianists from Wells Cathedral School. • Tuesday, October 16: Wells Cathedral School’s New Music Ensemble, featuring compositions by students. • Wednesday, October 17: Wells Cathedral School’s New Music Ensemble, featuring compositions by featured composer Diana Burrell. • Thursday, October 18: Jeremy Cole (assistant organist, Wells Cathedral) performs a recital of organ music for new music wells 78-18, including works by Michael Berkeley CBE (in his 70th birthday year), Judith Bingham, Barnaby Martin, and Tarik O’Regan (in his 40th birthday year). The great 1923 Gothic silent movie The Hunchback of Notre Dame is to be shown on the big screen in Wells Cathedral – England’s first Gothic cathedral – with a live improvised organ soundtrack. 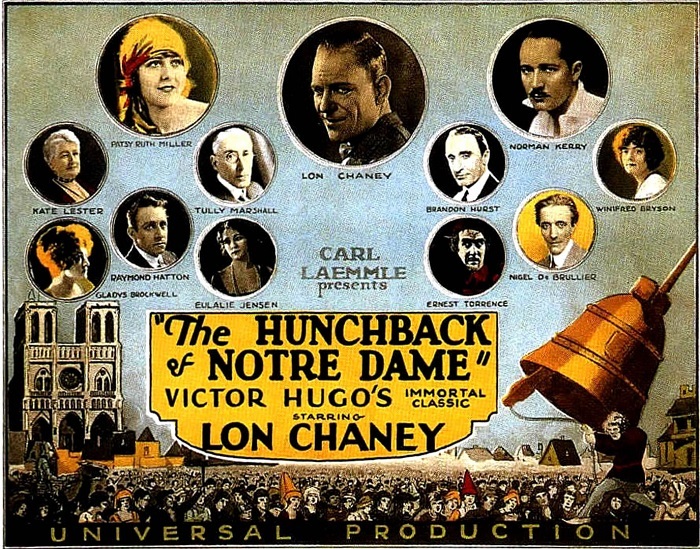 The film starred the great silent movie icon Lon Chaney as Quasimodo, the cathedral’s spectacularly deformed bell-ringer, not to mention a huge cast of up to 3,500 extras. Musical accompaniment to the film will be improvised on the Cathedral’s great organ by David Bednall, one of Europe’s finest improvisers. He was formerly the assistant organist at Wells Cathedral and is now a Bristol-based performer, composer and lecturer. The showing of the film is a fundraising event for Wells Cathedral Chorister Trust, which helps young singers from all backgrounds to train in a world-class musical environment regardless of their financial circumstances. It takes place on Wednesday, October 17. Tickets, priced £10-£20, are available from www.wcct.co.uk or by calling 01749 834483.